On April 12, as the Sun was blocked by the disk of Saturn the Cassini spacecraft camera looked toward the inner Solar System and the gas giant’s backlit rings. At the top of the mosaicked view is the A ring with its broader Encke and narrower Keeler gaps visible. At the bottom is the F ring, bright due to the viewing geometry. 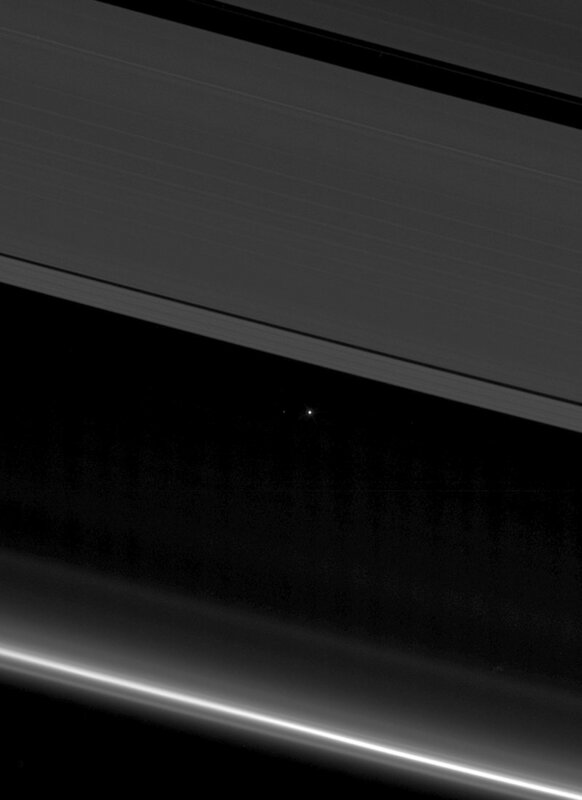 The point of light between the rings is Earth, 1.4 billion kilometers in the distance. Look carefully and you can even spot Earth’s large moon, a pinprick of light to the planet’s left. Today Cassini makes its final close approach to Saturn’s own large moon Titan, using Titan’s gravity to swing into the spacecraft’s Grand Finale, the final set of orbits that will bring Cassini just inside Saturn’s rings.